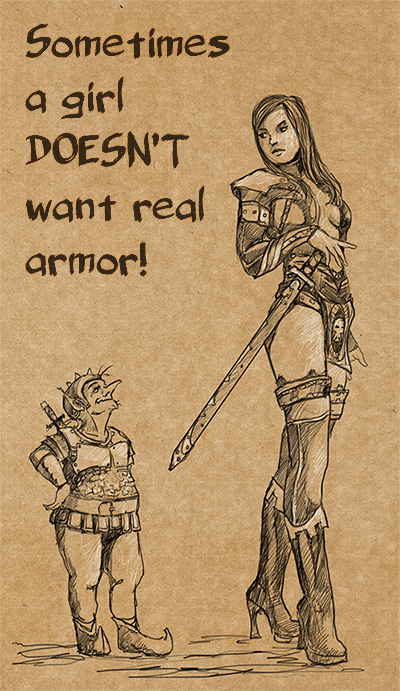 There are times when a girl just doesn’t need to have practical armor to defeat the goblins. We all know dungeon crawling isn’t the same as pub crawling and this gal has decided to take a softer approach to getting information out of the goblin guard. The more I am seeing this image, the more I am seeing it as the Goblin being a little ‘queeny’ in attitude, and immune to the charms of the lass trying to coax information out of him. I mean, I don’t think he likes girls in ‘that way’.